Order in 4 Hours 39 minutes 45 seconds for dispatch today! With a 500g fill weight, the Torpedo 500 is a classic Alpine mountaineering bag. Suitable for most summer mountaineering in ranges up to 16,000’ (5000 m), the 500 can not only be pushed into the shoulder periods of spring and autumn at lower altitudes, but actually is a very useful bag for non-mountaineering activities such as back-country hiking, trekking or travelling. With its weather-resistant shell and premium down fill, the Torpedo 500 is the most versatile bag in the crux range. 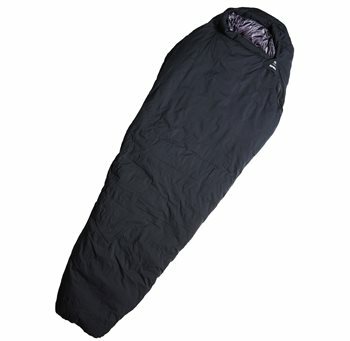 Look at our sleeping bag selection chart for guidelines. The Torpedo 500 can be upgraded with the addition of one of new Radioactive range of sleeping bag liners (which can also be used as stand-alone ultralight bags) which will be available from Spring 2015. Used the bag down to -5 degrees Celsius over 4 nights with no problems; very warm indeed. The waterproof outer is good for when your bag ends up against the foot of the tent (sliding on uneven ground! ), no condensation got through and everything was dry as was expected. I've used it once without a tent but not in any conditions that would test the outers waterproofness but it worked very well. The outer shell looks and feels very durable and it's easy to remove spots of dirt without getting the down wet. My only gripe is that you will only be able to zip it up with another Torpedo due to the Riri zipper.